With the dozens of ideas and variations for natural oven cleaners all over the web, I was very skeptical as to what would work and what would not. 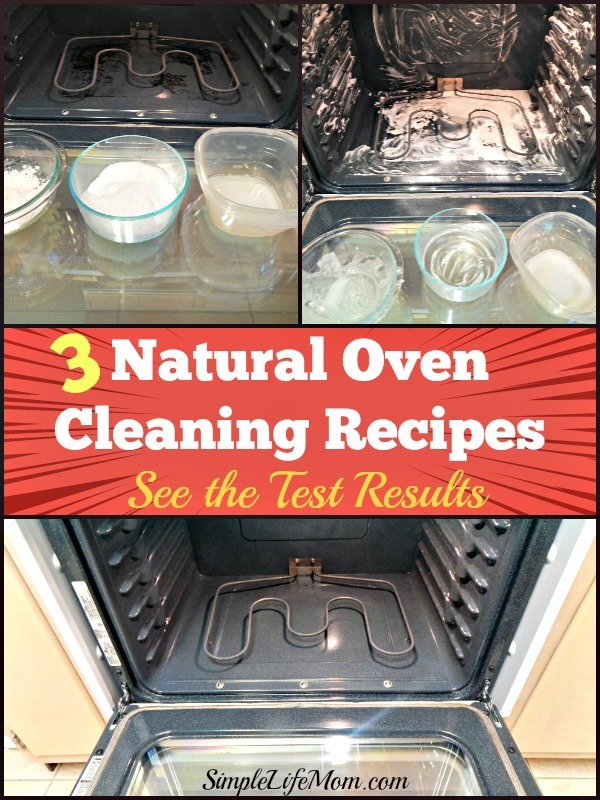 I decided to take the most popular 3 Natural Oven Cleaning Recipes and put them to the test. Most recipes have a variation using baking soda or washing soda, and for good reason. It has incredible cleaning powder. It helps to understand that the difference between washing soda and baking soda is slight, but important. Washing soda comes from the same “rock” so to speak. It is just that the molecules are left larger. For this reason, I like to use washing soda on projects such as oven cleaning. A few of the sights I found useful were The Prairie Homestead and Yum Universe (along with a plethora of others with slight variations). I ended up changing proportions from the recipes I found to make logically more consistent pastes, or making better portions. But I had to test them myself. See the Results below. Step 1 to all oven cleaning – give it a good wipe down. You can see from my picture that I already got up the wet or charred bits. I did no scrubbing, but a good wipe down does wonders. Step2 to keeping a clean oven is wiping it down more regularly. If you wait months, then you’re going to have a harder time cleaning it. Make into a thick paste and leave for a few hours or overnight before scrubbing. Combine ingredients. The will form a foamy paste. Rub onto the surface and leave for a few hours or overnight before scrubbing. Combine borax, white vinegar, dish soap, and water. pour onto bottom of oven and sprinkle with baking soda. Leave for a few hours or overnight before scrubbing. There was a clear winner in my mind. Recipe #2 with just washing soda, dish soap, and vinegar seemed to work great in comparison to the other two. I put #2 on the entire front and sides of the oven, #1 on the left, #3 on the right. Right away I liked how #2 felt – it feels creamy and sits easily on whatever you put it on without crusting off or running off. I waited 4 hours. As soon as I started on #2 I was happily surprised. My kids had declared which one they thought would win so they were standing on my heals as I tried scrubbing. Everywhere #2 sat was scrubbing up nicely. The other two helped somewhat, but not nearly as much as the first. The clear loser in my mind was #3 with borax. I don’t think the proportions were right enough to allow the vinegar to loosen the baked on grease. It loosened some bits, but I had to scrub a lot harder with it than the other two. With #1, I’m sure the salt was a big help in scrubbing. In the end, I ended up putting recipe #2 on the other areas before finishing the scrubbing. ** Hint, when it comes to those last little stubborn bits, I used the point of a steak knife back and forth. They came right off. I will have to give #2 a try, thanks! Tell us how it goes Joy! I love natural cleaners! Thanks for evaluating these recipes…very helpful! I love your blog!! What is washing soda? Thanks and keep the natural info coming!! Washing soda is explained above. It is a form of baking soda and can usually be found in the detergent section of your store. I am going to try this next time I clean the oven – I cleaned it yesterday using a chemical cleaner and as I was applying it I had to keep running into the other room to breathe! And it didn’t even do a very good job! Next time, #2! Great recipes! The oven has always been the biggest challenge for me when it comes to cleaning! I am definitely trying them! Thanks a lot! Greets, Homerton Carpet Cleaners Ltd.
Great information…I needed the over cleaner idea. Thanks for sharing with the Thursday Blog Hop! Definitely keeping this in mind! 🙂 Thanks for sharing at Savoring Saturdays! I clean my oven with a similar recipe. My only tip is to be carefull with the scrubbing part as you don’t want to scratch the surface. A lot of the new ovens have a special non-stick surface, which once damaged might start rusting. Cheers, Miranda. I love the recipes! I hate cleaning the oven and unfortunately I don’t do it often enough. 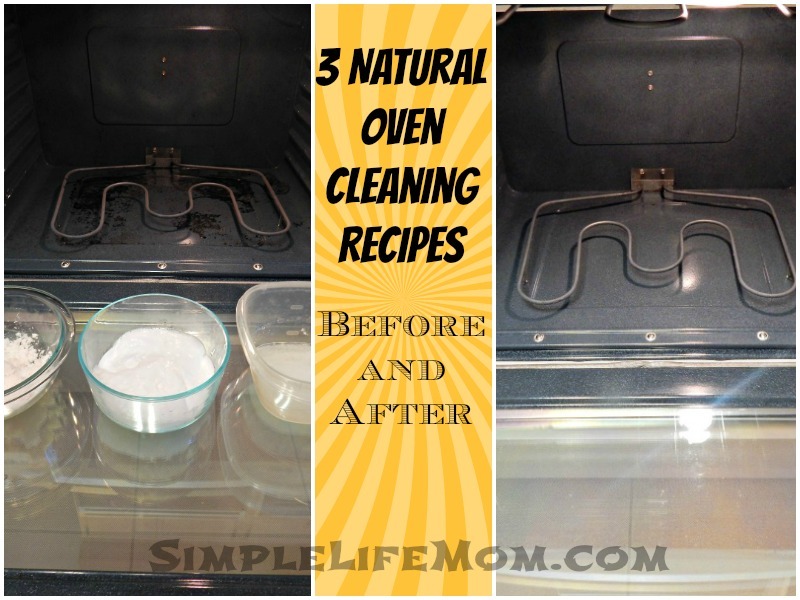 I heard from friend and mom bloggers that baking soda works perfectly for cleaning the oven. This weekend will be the cleaning day and I will try one of the recipes! I am really excited to try some homemade cleaners! Thanks for sharing! I tried step #2 with my oven and toaster oven, they both came out very clean. However I noticed that the next day when we used both the toaster oven and stove oven the both give off a soap smell. Almost like the soap did not whip off that will. I even used a wet cloth to whip the inside out. So not sure what went wrong. So next time around I will try step #1. Thanks for the cleaning tips. Thanks for sharing so many variations and letting me know which is your favorite. I’ll jump straight to that one and I’ve got all the ingredients handy! What do you use to rub the foamy paste on to the surfaces of the oven? One recipe I tried said to use a vinegar spray to remove any reside. Maybe that would take the smell/taste of soap. You can. By simply washing with a clean cloth and water you remove any residue.